The presence of an awning can make a considerable difference in how your home is viewed by neighbors and those driving by. Window awnings are a beautiful addition for your home, and there’s plenty of choices you can make when it comes to their design. The presence of an awning can make a considerable difference in how your home is viewed by neighbors and those driving by. There’s some unknown information when it comes to awnings, and this article will aim to give you a clear look into why they’re so beneficial. 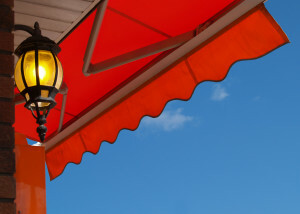 What’s The Purpose Of An Awning? The initial function of an awning is to defend, or protect from overbearing sunlight. It’s providing shade, whether it’s hot or cold outside. Window awnings can effectively decrease the amount of sunlight that is accessing your home. Natural light is a great asset to have in your home, but having an excess of it can be distracting, and simply unpleasant. An alternative purpose of the awning is that it provides an immediate sense of visual value, which is always a welcomed addition. Awnings come in different shapes and sizes, and there’s plenty of different ways you can go. There are three main awning types for homeowners to choose from: retractable, stationary, and basket awnings. The retractable awning is pretty straightforward, as they can go back and forth. They offer a flexibility that others can’t match. They also require less maintenance than your average awning. Stationary awnings are probably the most common, and they can be customized as well, depending on what design you prefer. These might be the best choice when it comes to window awnings. Finally, basket awnings are great for the small businesses of the world. Basket awnings will mainly be found on tiny shops or stores. All of these options give you value, whether it’s being place on a home or business.